MAP: Dr. Syntax's Head. Click thumbnail to enlarge. The mainland coast of Britain measures around 7,000 miles in length. 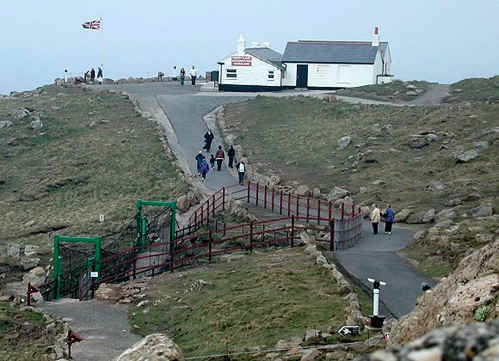 For anyone attempting to walk that route this place is clearly somewhere of significance: above Dr. Syntax's Head near Land's End, Cornwall stands the First and Last House. By any reckoning when this place is reached a corner must be turned, and the journey will take a new direction, and a whole new mind set will come into play. Indefatigable photographer Charles Winpenny took the picture, part of his daily record of Cornwall. Charles walked the six miles along the coast from Sennen Cove, past Dr. Syntax's Head and nearby Land's End, then on to Nanjizal. If you visit Charles' web site in the next day or two you will also be able to see pictures of the wreck of the 1,846 tonnes cargo ship RMS Mülheim. The ship was carrying 2,200 tonnes of waste plastic destined for a landfill site en route from Cork, Ireland to Lubeck, Germany when she ran aground at 04:30hrs on Saturday 22 March 2003, removing the bottom of her hull in the process. I wondered about the strange name of this place: a local, one Jeff Lewis, is quoted in 'Gavin's Adventures on the Mystical Isle of Britain' giving the explanation that the name is a reference to a fictional character created in the early 19th century by engraver Thomas Rowlandson, and verse writer James Combe, in a series called 'The Tours of Dr. Syntax' satirizing William Gilpin's 'Three Essays on the Picturesque'. Locally several of the curiously shaped rock formations have fanciful names such as the 'Armed Knight' and the 'Irish Lady', but I was unable to make the expected connection between Dr Syntax and the nearby Dr. Johnson's Head. Charles' walk was a subset of the CCF (Cornwall Coastal Footpath), which in turn is a subset of the SWCP (South West Coast Path), which at 630 miles in length is the longest National Trail in Britain. My former colleague Robert, who has dragged me along on a number of shorter day walking expeditions, tramped this route alone, and reported that the rise and fall of the path makes it a much more strenuous endeavor than might be expected from an essentially sea level route. Carolyn Lee and Andy passed this way, their Land's End leg just part of their goal to walk the complete coast of Britain, recorded on their 'Keep to the Left' web site. Family commitments have dictated that their whole project has been broken down into a number of subsets that they are tackling in a series of vacations. Eventually there are no more subsets: the daunting challenge that remains is to walk the complete 7,000 mile journey around the shores of mainland Britain. I know of one man who has done it as a single complete journey, interrupted only by the minor inconvenience of a strain fracture to his leg caused by walking 25 miles every day laden with the heavy pack required to support his trek. That man is John N. Merrill, whose book 1979 book 'Turn Right at Land's End: The Story of his 7000 Mile British Coastal Walk' (Oxford, UK: Oxford Illustrated Press) records the achievement. Clearly the author, whose journey started and ended in the center of London, thought that Land's End was somehow a significant point on his journey, both physically and psychologically. Most of John's books seem to be out of stock or out of print when I checked: I read this book many years ago and would like to do so again. Intriguingly, given the subject of yesterday's item, also listed under the same author name is a book called 'Turn Right at Death Valley'. Tomorrow I will continue with a second item on heroic over achievers in the field of walking.